The Syrian cease-fire agreement that US Secretary of State John Kerry and Russian Foreign Minister Sergey Lavrovannounced Friday night, September 9, in Geneva hands Syrian affairs over to Russia’s President Vladimir Putin and the country’s military. The accord marked a sharp reversal for Washington. 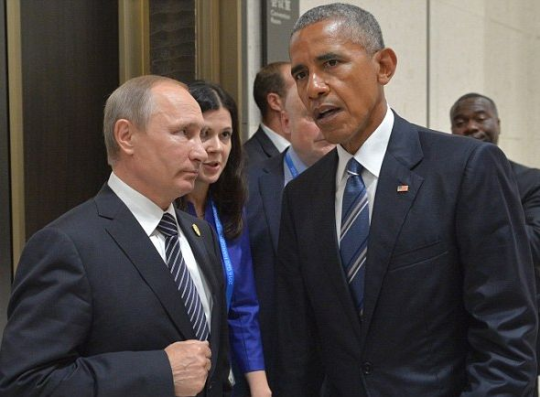 In his meeting with Putin in China last week, US President Barack Obama did not agree to those steps for the simple reason that such an agreement would be in line with the policy and stance of Republican presidential nominee Donald Trump, not those of the Democratic nominee Hillary Clinton. Trump suggested several months ago that the US should let Putin finish the war in Syria, asserting that the Russian leader would be able to do it better. Under the current situation it is no wonder that Kerry and Lavrov agreed not to release the details of the agreement. Publication of the details would reveal that the rebels in the Aleppo area, and perhaps in all of Syria, have been abandoned. The Syrian rebels now find themselves trapped by both the Russian-Turkish agreement and the Russian-US agreement, with a noose seemingly closing around them. The fledgling “initiatives” reverberating this week in Washington, Moscow, Ankara, Jerusalem and the G20 summit were nothing but distractions from the quiet deals struck by two lead players, Russia and Turkey to seize control of the region’s affairs. Recep Tayyip Erdogan knew nothing would come of his offer on the G20 sidelines to US President Barack Obama to team up for a joint operation to evict ISIS from Raqqa. And, although Moscow was keen on hosting the first handshake in almost a decade between Israeli Prime Minister Binyamin Netanyahu and the Palestinian leader Mahmoud Abbas (Abu Mazen), neither were known to be ready for the last step toward a meeting. But the game-changing events to watch out for took place in Hangzhou without fanfare – namely, the Obama-Putin talks and the far more fruitful encounter between Putin and Erdogan. According to debkafile’s intelligence and Mid East sources, Putin virtually shut the door on further cooperation with the United States in Syria. He highhandedly informed Obama that he now holds all the high cards for controlling the Syrian conflict, whereas Washington was just about out of the game. Putin picked up the last cards, our sources disclose, in a secret deal with Erdogan for Russian-Turkish collaboration in charting the next steps in the Middle East. The G20 therefore, instead of promoting new US-Russian understanding, gave the impetus to a new Russian-Turkish partnership. Erdogan raked in instant winnings: Before he left China, he had pocketed Putin’s nod to grab a nice, 4,000-sq.km slice of northern Syria, as a “security zone” under the control of the Turkish army and air force, with Russian non-interference guaranteed. This Turkish zone would include the Syrian towns of Jarablus, Manjib, Azaz and Al-Bab. Ankara would reciprocate by withdrawing its support from the pro-US and pro-Saudi rebel groups fighting the Assad army and its allies in the area north of Aleppo. Turkey’s concession gave Putin a selling-point to buy the Syrian ruler assent to Erdogan’s project. Ankara’s selling-point to the West was that the planned security zone would provide a safe haven for Syrian refugees and draw off some of the outflow perturbing Europe. The head of this NATO nation has moreover gone behind America’s back for a deal with the Russian ruler on how to proceed with the next steps of the Syrian conflict. Therefore, when US Secretary of State John Kerry met Russian Foreign Minister Sergei Lavrov in Geneva Thursday and Friday, Sept. 8-9, for their sixth and seventh abortive sit-downs on the Syrian issue, there was not much left for them to discuss, aside from continuing to coordinate their air traffic over Syria and the eastern Mediterranean. Washington and Moscow are alike fearful of an accidental collision in the sky in the current inflammable state of relations between the two powers. As a gesture of warning, a Russian SU-25 fighter jet Tuesday, Sept 6, intercepted a US Navy P8 plane flying on an international route over the Black Sea. When the Russian jet came as close as 12 feet, the US pilots sent out emergency signals – in vain, because the Russian plane’s transponder was switched off. The American plane ended up changing course. Amid these anomalies, Moscow pressed ahead with preparations to set up a meeting between the Israeli and Palestinian leaders, as the Russian Foreign Ministry announced Thursday. Putin is keen to succeed where the Obama administration failed. John Kerry abandoned his last effort at peacemaking as a flop two years ago. But it is hard to see Netanyahu or Abu Mazen rushing to play along with the Russian leader’s plan to demean the US president in the last months of his tenure – especially when no one can tell who will win the November 8 presidential election – Hillary Clinton or Donald Trump – or what policies either will pursue. All the region’s actors will no doubt be watching closely to see how Turkey’s “Russian track” plays out and how long the inveterate opportunists can hang together.